So the sun came out...I got all excited and thought YES spring is out and I am buying daffodils. And then it went grey again. and it drizzled. ha so as a result I did a round of some actually pretty awesome grey things from etsy. Its making me feel better about the greyness...especially because there are a few pops of yellow going on. a classic colour combination yes! 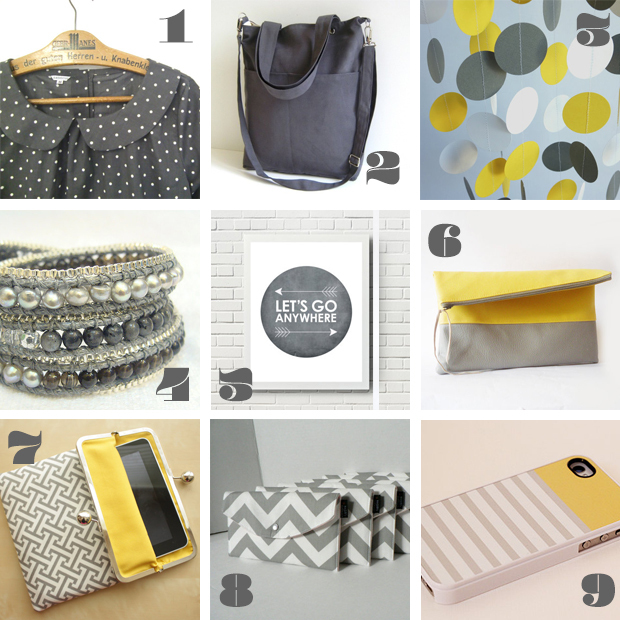 I can't get enough of these fold over clutches (6) it is about time I bought one. 7 is oh so awesome...and if NM's ipad actually happened to be mine (ahem pretty sure there is something in the wedding vows about all his stuff becoming mine too!) then I would happily house it in this beautiful ipad sleeve/purse thing. I am always a fan of a polka dot garment (1) and if I hadn't already got presents for my bridesmaids 8 would have been an awesome option! pretty much I am in love with all the things in this weeks round up! Hope the weather is a bit brighter where ever you are! Hurry up spring!